With all the uncertainty over U.S. President Trump's travel ban, students and academics are considering alternatives to U.S. universities — providing a great opportunity for a boon for Canadian institutions. On Feb. 3, a federal judge in Seattle issued a restraining order against U.S. President Donald Trump's temporary ban on refugees and travellers from seven predominantly Muslim countries. The White House lost an initial appeal of that ruling, Feb. 5, but has vowed to continue the fight in the courts. For now the travel ban is not being enforced but many international students enrolled at American schools are left feeling uncertain about their place in the U.S. — and some are considering to study elsewhere, including Canada. Sohrab Redjai Sani, a postdoctoral associate in the Material Science and Engineering Department at MIT, is considering his options. He tells The Current's guest host Laura Lynch that he imagined himself living in the U.S. for a long period of time but now he feels his future is in the balance. "The uncertainty of day-to-day life … living in this situation is not pleasant, and takes so much energy and planning — at some point I need to figure out if this worth it." Before Trump's election Redjai Sani says he did face discrimination in the U.S.
"I had difficulties getting access to advanced research facilities, such as in Stanford and national labs in Brookhaven National Lab because of my nationality," he tells Lynch. "Working in similar facilities back in Europe when I was doing my grad study both in Sweden, France and U.K., with no problem and I managed to find and do good research in those facilities." Redjai Sani doesn't want to a rash decision and will consider his options in the next couple of months but says Canada is in the running. "I like the culture of North America. I've lived in Europe for many years — about nine years." He says the diversity in North America is appealing and see the University of Toronto and the University of British Columbia as "very interesting opportunities." 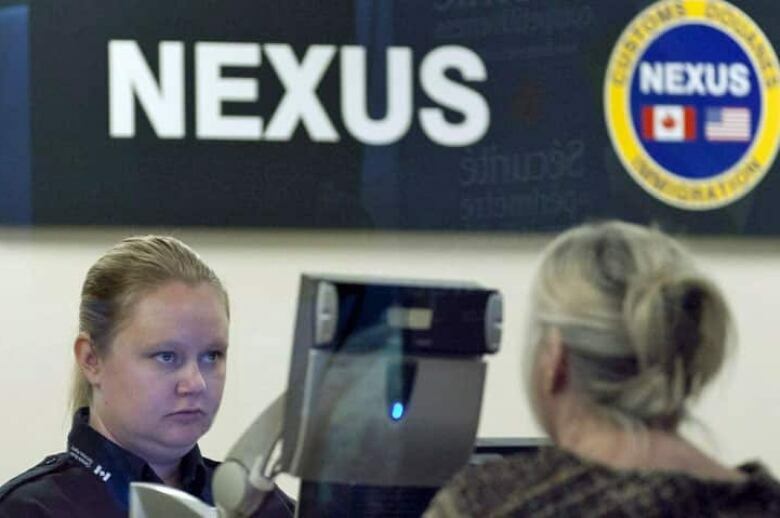 Nexus memberships have been revoked from all Canadian permanent residents with citizenship in any one of the seven majority-Muslim countries affected by the U.S. travel ban. One school in Canada that is actively reacting to the U.S. travel ban with a bold and welcoming message is Memorial University of Newfoundland. The university has offered to waive the application fees of students applying from the seven countries named in President Trump's executive order. "It was an easy thing to do right away," Noreen Golfman, provost and the academic vice-president of Memorial University, tells Lynch. Golfman says the university wanted to signal to students a welcoming and inclusive school for not just people applying from the seven countries affected by the travel ban but from people in the U.S.
"We've also, I should add, indicated that we're exploring some form of scholarship support for students who do get admitted from many of those countries," Golfman says. Depending on what happens with that battle in the courts, and the larger climate toward immigrants in the U.S. Massieh Moayedi says Canada should see this opportunity as a brain gain for institutions. Moayedi is an assistant professor in Faculty of Dentistry and the Collaborative Program in Neuroscience at the University of Toronto. "I'm Iranian-Canadian so I was initially banned before the Trudeau government negotiated my ability to go [to the U.S.] and that would have affected my ability to attend conferences, share ideas and start collaboration." He tells Lynch that he would love to see institutions in Canada "attract this talent." "We have world-class institutions here. We do world-class research and it would be fantastic to get these amazing students and academics here to help grow our research portfolio, grow our research funding and also just grow our talent pool." "And beyond that I think the open and warmer culture in Canada might actually help foster a larger migration towards here and help us grow that aspect of our economy." ​This segment was produced by The Current's Lara O'Brien and Ashley Mak. Becoming sanctuary cities being discussed in Saskatoon and Regina, but what does that mean?